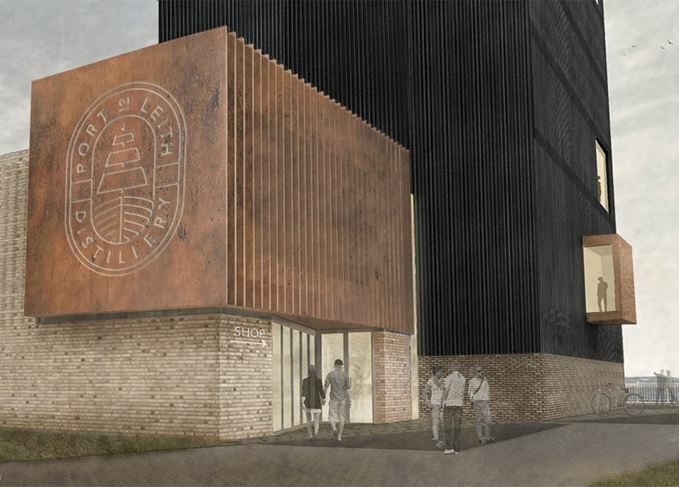 The company behind the anticipated Port of Leith distillery in Edinburgh have unveiled plans for Scotland’s first vertical distillery. 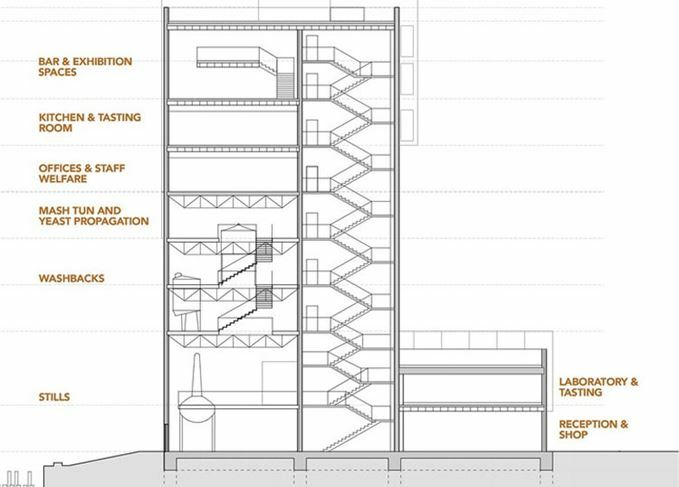 Plans submitted this week to Edinburgh Council reveal designs for a ‘landmark’ 40-metre distillery tower, with the various stages of the whisky-making process laid out from top to bottom. If successful, the £5 million enterprise in Edinburgh’s port district will be the first distillery in Scotland arranged vertically. The top floors will house a lab and blending facility, tasting rooms and exhibition spaces, as well as a rooftop bar and restaurant with northward views across the Firth of Forth. The mash tun will be housed on the middle floor, the washbacks on the floor below and the stills at ground level. The vertical design also has practical uses: the gravity-led layout is expected to improve efficiency, similar to the design of Mackmyra distillery in Sweden, while the adjacent harbour will be used as a heat sink for cooling water, ‘significantly’ reducing the volume of water needed in the production process. In addition, the Port of Leith distillery will be capable of producing up to 400,000 lpa (litres of pure alcohol) each year, and is in a race to become the first new malt whisky distillery in the Scottish capital for 100 years. There are currently two additional whisky distilleries planned for the city – Halewood’s microdistillery in Granton Harbour, and the Holyrood Park distillery at the Engine Shed, which is currently embarking on a fundraising drive. The company behind the scheme, Muckle Brig Ltd, has partnered with Heriot Watt University’s International Centre for Brewing and Distilling on a product development and research programme, which will continue through the distillery’s construction. The partnership will eventually allow students access to the building’s lab and blending facility, as well as provide work experience and internships at the distillery. Ian Stirling, co-founder of Muckle Brig, said: We have set out to create a new whisky business with innovation, education and openness placed at the forefront of our operations. 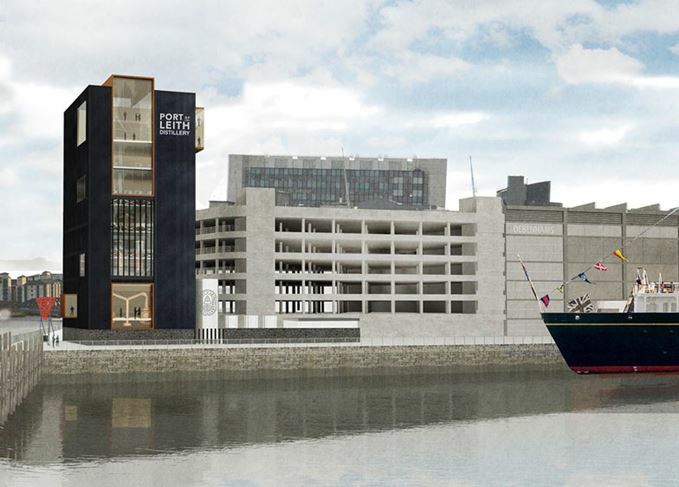 Pending planning approval, work is expected to commence building Port of Leith distillery at the start of 2018, with an opening slated for Spring 2019. Edinburgh’s last malt whisky distillery was Glen Sciennes (also called Edinburgh distillery), which closed in 1925. However Leith itself was a popular base for Scotch whisky blenders, its port having been granted a license to store whisky under bond as early as 1822. Patrick Fletcher, co-founder of Muckle Brig, added: ‘Leith was once the national hub for the Scotch industry and it’s really exciting to be restarting that tradition. ‘Our business will boost the local economy by drawing more tourists and residents down to the harbour and providing many new jobs. ‘Leith has been on the up for many years and we’re really excited to be building where we are, right in the heart of the docks. In the meantime, Muckle Brig plans to begin producing gin in a separate space in Leith from October. Plans for the Scotch whisky distillery include an adjacent floating bar and restaurant. Our guide to the whisky-related events on offer throughout August in the Scottish capital.